Winter is the time to shape your fruit trees for the next delicious harvest. 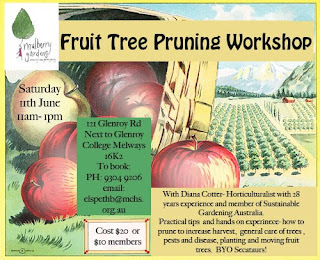 Come learn from an experienced horticulturalist and gain some practical experience on how to make the best of your trees. 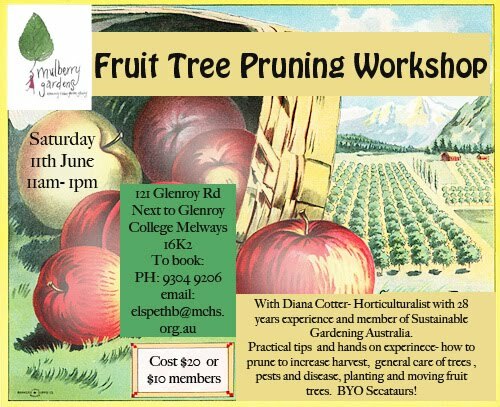 Places are limited please contact Elspeth on 9304 9206 or elspethb@mchs.org.au to book. Russ Grayson has some interesting things to say about land alienation objections that arise in response to proposals for community gardens on public open space on the Australian City Farms & Community Gardens Network website. Come and help us construct a 100m long raised garden bed for the Commons using earthbags! We’ll be putting into practice the skills learned during the previous weeks earthbag workshop to build a 100m long, half meter high curvy retaining wall that will become our café garden beds. It should be lots of fun and we are happy to share some of the knowledge gained during the previous weekend workshop. Come and join us - ‘learn by doing’ - Get active, meet new people and make a difference. Get your hands dirty and learn more about the fine art of composting! Put on by our neighbouring council.